I taught my first college course at Lee University in 2001 (Introduction to Christian Thought). I entered class that first day rocking a bow tie and sports coat and I’ve been wearing them ever since. 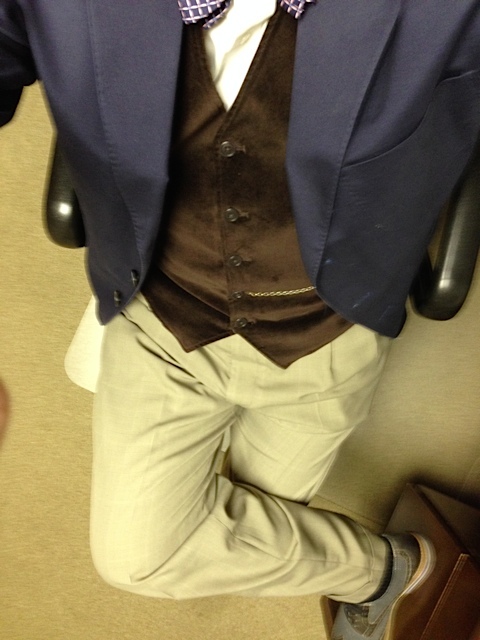 After I completed my Ph.D. last year, I ramped up my ensemble with vests and this brought an excellent side effect – I was able to incorporate the pocket watch I inherited from my grandfather. When I’m wearing the whole thing, I feel ever so much like a professor. I’m sure it’s because my mental picture of ‘professor’ was formed as a child by watching Paper Chase and reading C.S. Lewis. Like when a pro athlete puts on their uniform, or Walter White slips on the Heisenberg hat, my prof duds are my teaching uniform. I’m also a Vineyard pastor which is pretty much at odds with my professor get up, since Vineyard was the birth place of the “come as you are” church trend. It started as a hippie thing. Hippies would literally accept anyone, regardless of attire or pretty much anything else, and the hippies who became the Jesus people who became the Vineyard carried that vibe forward and accentuated that acceptance applied most especially to coming to church. This was important since some of these folks came to Jesus while naked or high on LSD or both. (Go ahead and read that sentence again and let it sink in.) They were known to get stoned (so no telling what they were wearing) and then read all the way through an entire Gospel together out loud, with everyone weeping at the end. So “come as you are” was a necessary part of their existence as a community of faith. Of course, now we’ve reduced that to just mean “go ahead and dress casual,” and most churches have adopted it, since the overall culture has gone casual anyway. This led one pastor to complain in a CNN article back in April, decrying the tacky state of church attire in America (you can read the article here). The article made the point that in lowering our standard of dress as a culture, we show a lack of gratitude and respect in general, which is not a good posture for believers to take before God. A few days ago, fellow local pastor (and acquaintance, he set up the security system at our church last year) Bill Rose blogged about this, showing respect for the other pastor, but concluding that God overlooks our tacky dress because God cares more about our souls than our clothes (click here to read Bill’s post). I wanted to weigh in on this because there are a couple of aspects of this I have not seen discussed, either from the CNN article, or Bill, or anywhere else so far. The first has to do with how clothes function in our lives (beyond their obvious practicality). There is both social and personal psychology to clothes – clothes cause others to think of us in certain ways and us to think of ourselves in certain ways. And these aren’t isolated, they inform and feed on each other. If your clothes make you feel more confident, others pick up on that confidence and it affects what they think of you and probably impacts how they ‘read’ your clothing. I don’t think many of my students are overly enamored of my Paper Chaseesque attire, but the self-confidence it gives me tips the balance in this social-personal cultural nexus. It helps me feel like a professor, so I talk and act in a more professorial way and my students respond accordingly. I shift gears when I pastor. 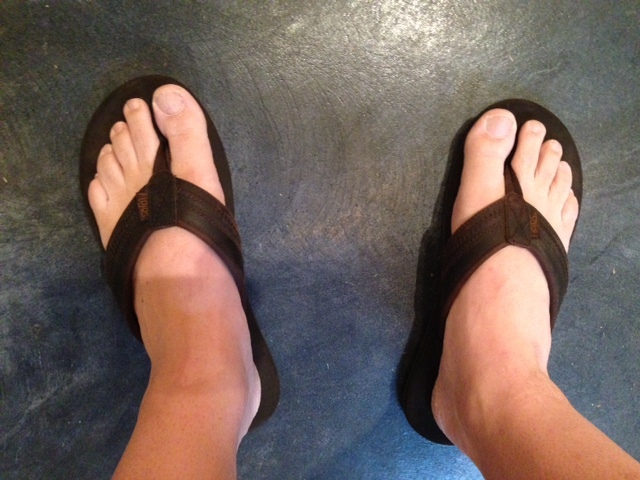 I wear sandals (I preach in these most Sundays), jeans (occasionally shorts), and a casual button-down or tee shirt. I do this intentionally because I stand in a certain tradition, the Vineyard, and this is part of who we are. We’re this odd mix of hippie, Quaker, and Pentecostal, and preaching in flip flops helps me live into that vibe the same way bow ties, vests, and a pocket watch help me get my professor on. Once in a while, my worlds collide in the best way and I look what a Vineyard professor might look like (if we had such a thing, see last pic below). The fancy term for this is “enclothed cognition” (read this Forbes article for more info). All of these clothing cues inform my self-image and the image I project to others. But notice that this nexus is two-dimensional. At no point does it involve God. What you wear has no impact on what God thinks of you. Zero. God doesn’t have to “overlook” what you’re wearing. It simply doesn’t matter. God cares whether you have clothes to wear or not (see Matt. 25.31-46), but your fashion choices are not of divine concern. And it’s not that your clothes are “filthy rags” to God; that thinking goes along with the idea of “total depravity” which just isn’t true (read an old post of mine for more on that). We get so stuck in our Western, business-casual thinking, that we forget our fashion choices are recent inventions and that our cultural conventions carry no divine mandate. In a time when the middle class in the U.S. is poorer than it has been at any time since the Great Depression, we need to back off on giving people grief about what they wear to the store or to the park or even to church. People can’t afford clothes like they could back in the day, well, except for when we buy clothes made by slave labor around the world. Trust me, God would rather you dress sloppy or tacky in clothes you already own than have you further contribute to the suffering of others. These are the things God cares about. But this doesn’t mean that what you wear to church doesn’t matter at all. It does matter because it matters to you. The point of going to church is to connect to God and to your community of faith, to meet God in worship and in the preached Word, to lift others up in prayer and receive ministry from them as well. You should wear whatever facilitates these activities for you. I freely admit that this entirely subjective and it has to be because we worship in different contexts and our deepest selves are in different places. Some of us have issues with our own body images. Some of us have been subjected to painful shaming (too often in church!). Some of us need to dress up to connect to God. Some of us need to dress down to connect to God. You should dress in whatever way helps you best connect to God. You should find and be part of a community of faith that best helps you connect to God. Clothing doesn’t matter to God because it’s only a two-dimensional thing. But life is not two-dimensional. Life is three-dimensional. You. Others. God. Don’t let what others think of you – or what you think of yourself – get in the way of connecting with God. Don’t let church get in the way of connecting with God. Don’t let anything get in the way of connecting with God. Pray naked if you have to (though I really can’t recommend the LSD, don’t do that, seriously). Your Sunday best is whatever helps you connect to God the best. What do you think? What sort of clothing helps put you in a good mental/spiritual state to connect to God? What has your experience with church been like in the past surrounding this issue? Please comment and let me know. I wrote a few thoughts down when I was reading a chapter that addressed this (http://thinktheology.org/2012/02/06/dress-codes-for-preachers-formal-informal-settings/), but this post was really helpful for me to think more on it. Thanks for writing it! Great post Michael! Well articulated. As a fellow Vineyard pastor I share your sentiment. In my own situation I live in a corner of NC that is socially conservative and my own Sunday ‘uniform’ is casual but not as casual as I sometimes wish. 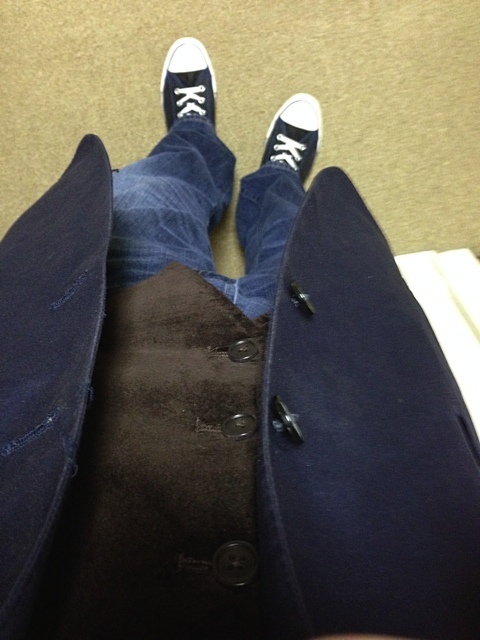 As I have interacted with folks from other nearby congregations, occasionally the topic of ‘church clothes’ comes up. To me it’s a real shame to hear that even ‘unchurched’ people are expected to dress in a certain way in order to attend said church. God is certainly more concerned with the attitude of the heart. Perhaps the church clothes thing I hear is one of those ‘southern religious things’, but I suspect it is more widespread than that.